Kino Flo True Match K55 lamps are high output fluorescent lamps that have been specially formulated for filming and digital imaging. Nominally balanced to photographic daylight colour temperature, K55 lamps can be used in natural daylight and with daylight balance fixtures (HMI) without filtration. Please read FAQ for more information. What is the difference between Kino Flos and store bought fluorescent's? 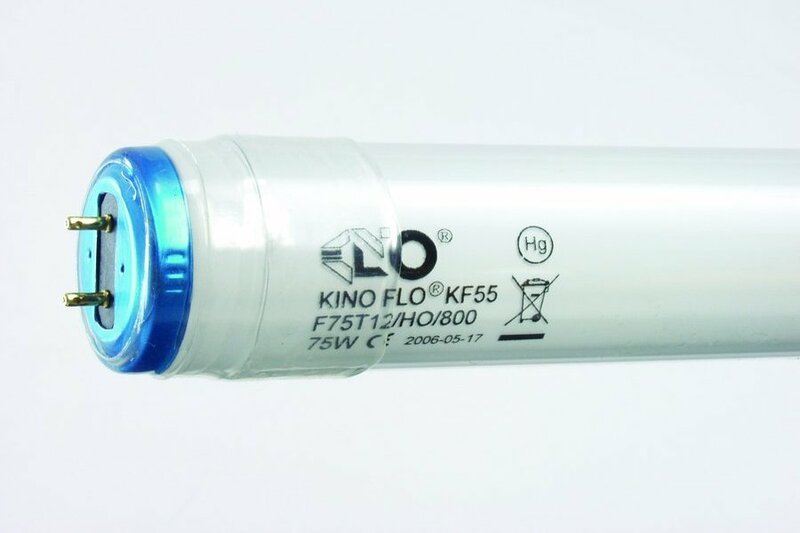 Kino Flo True Match® lamps are the only High Output (HO) fluorescent lamps designed to correspond to the spectral sensitivity of film and digital imaging. In 1995 Kino Flo was awarded an Academy Award for Technical Achievement for its unique lamp engineering and fixture designs. Is there a color difference between Kino Flo lamps operating in an architectural fixture vs. a Kino Flo fixture? Kino Flo’s 4ft and 2ft T12 800ma lamps can be used in architectural fixtures. Due to the lower operating currents of architectural fixtures, the Kino Flo lamps may appear slightly more magenta to the eye than the same lamps in Kino Flo fixtures. However, on film, video or digital the light quality of the two fixture types matches. What is the difference between single pin lamps and double pin lamps? Single pin lamps are referred to as Slimline fluorescent's. Slimline lamps will not operate on Kino Flo HO ballasts. Most double pin (bi-pin) lamps will operate on Kino Flo ballasts. However, Kino Flo HO ballasts will shorten the life span of store bought bi-pin lamps. Do Kino Flo lamps operate in architectural High Output (HO) fixtures? Architectural HO fixtures can range in lengths of 4ft, 6ft and 8ft. They use a lamp that has a double recessed bi-pin end cap. It looks similar to a single pin lamp but the pin is hollow and oval shaped. Kino Flo 6ft and 8ft lamps can be modified with an accessory Double Recessed End Cap that slides over the lamps normal medium bi-pins. However, Kino Flo 4ft lamps cannot be modified this way because architectural 4ft HO lamps are three inches shorter. Why do some lamps in a fixture seem slightly different? Slight variations in appearance are common from lamp to lamp. The age of a lamp and the batch number can account for variations. When evaluating color temperature, position the color meter at least 24 inches (.5 meter) from the fixture or lamp. Holding the meter too close may result in inaccurate readings. What does High Output (HO) mean? High Output (HO) is the term to describe lamps that are burning at a higher than Standard (Std) lamp current. Normal fluorescent lamp currents operate a lamp at between 280ma to 320ma. HO refers to lamps operating at or above 800ma. Lamps operating at 1500ma are referred to as Very High Output (VHO). Kino Flo Select ballasts can switch between HO/4ft and Std/2ft lamp operation. Why do my lamps read green on my color meter? In a fixture with restricted air flow, lamps can heat up and exceed the temperature operating range for good color. Lamps should never be fully enclosed with gel or diffusion. As the temperature of a lamp increases, so does the mercury pressure in the lamp. This increased mercury pressure appears as a blue green light. The higher the temperature the bluer and greener a lamp will appear. Tip: If a 4ft lamp is operating too hot and the color is shifting green, move the select switch to Std (or 2ft). This will reduce the lamp current and drop the green spike. All fluorescent lamps will drift toward magenta when dimmed. The shift is continual as the lamp physically cools. Kino Flo recommends only dimming one f-stop to ensure good color. The Select Ballast series changes light levels without affecting color balance by switching lamps on and off, and by using the 2ft/4ft select switch, which adjusts the lamps by 1/2 f-stop. How do color meters read fluorescent lamps ? Unfortunately, color meters available to cinematographers are far from being scientifically accurate when reading fluorescent's. They act as a great comparative tool to determine differences between twogiven light sources but are inadequate in providing definitive data. You will rarely find two color meters, even if they are the same make and model, that provide equal data. Results between meters may be similar but not identical.